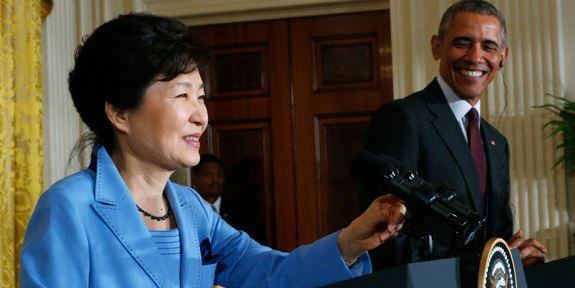 South Korean Park Geun-hye recently met President Barack Obama in Washington. Nominally it was a meeting between equals, but Park reaffirmed her nation’s continuing dependence on America. The U.S.-ROK alliance was created in the aftermath of the Korean War, which left the South wrecked and vulnerable to Pyongyang, then allied with both China and the Soviet Union. That world is gone. America’s security commitment is an anachronism, a leftover from a distant era. There’s no doubt why Seoul continues to support the security relationship. The South saves money relying on the global superpower for protection. As Scott Snyder of the Council on Foreign Relations put it, the alliance lessens “South Korea’s vulnerability to North Korea and rising Asian rivalries.” A related point was made by Van Jackson of the Center for a New American Century, who argued that America’s defense commitment helps deter the North from attacking the ROK. Of course, that is the usual point of defense: prevent a war from happening and win it if it occurs. But the U.S. guarantee acts as a deterrent for the South, not America. The alliance serves South Korea, not the U.S.
Like most of America’s alliances, the U.S.-ROK treaty is entirely one-sided. Americans do the defending. South Koreans get defended. Moreover, Washington’s constant promise to go to war creates a greater risk of conflict involving America. Deterrence frequently fails. Often in small ways as with the North. Sometimes catastrophically as in World Wars I and II. Those protected also are more likely to be confrontational, creating a greater risk of conflict. If deterrence fails, the alliance ensures that U.S. will be drawn into an otherwise avoidable conflict. And if things go wrong in Korea, they could go really wrong. Adm. Bill Gortney, commander of the U.S. Northern Command and the North American Aerospace Defense Command, opined: “We assess that they have the capability to reach the homeland with nuclear weapons from a rocket.” Kim Jong-un almost certainly doesn’t want war, but he may not be prudent enough to avoid it. Of course, America has plenty of interests around in the world, including in the Korean Peninsula, but most are not worth the risk of war. Charity is no basis for foreign policy. After all, Washington could seek to deter all war by scattering American garrisons even more widely. Doing so presumably would enhance deterrence, as Jackson wishes. But for other nations. While costing America much. Especially in the case of states such as South Korea, which, like Japan and Europe, is capable of protecting itself—both deterring and winning. Indeed, it beggars the imagination that a nation with a 40-1 economic edge, 2-1 population advantage, significant technological lead, dramatically larger industrial base, more resilient infrastructure, and vastly stronger international position could not build the military necessary to deter its far weaker antagonist. Jackson also worried about U.S. credibility should Washington restructure a defense relationship a mere 62 years after forging it. Actually, credibility is at risk when one makes promises that one does not keep, not changes old promises to fit new circumstances. More interesting is Jackson’s concern that insisting South Korea act as an adult nation might cause it to revive the nuclear program begun a half century ago. Nonproliferation is an important goal, but not one of unlimited value. Today Northeast Asia demonstrates the ill effects of an international version of gun control: only criminals have guns. China, Russia, and North Korea possess the ultimate weapon. None of America’s democratic allies are so armed. So America is expected to risk Los Angeles to protect Seoul, Taipei, Tokyo, and who knows where else. Washington needs to consider whether the second best of a South Korean nuclear weapon is worse than the second best of an American nuclear umbrella. Especially since the possibility of proliferation to U.S. friends might cause Beijing to more seriously pressure North Korea to halt the nuclear parade. Unfortunately, President Park’s visit was wasted. The two governments should discuss how to transform the alliance into a relationship of equals. South Korea has reached the forefront of nations. It should act the part.